Just because gate guards are stuck on a gate 24/7 and can’t go to parties doesn’t mean they can’t still have fun. The guys working out here on the rigs really enjoy it when the guards decorate, wear costumes, and hand out candy or cook for them. I carry holiday decorations onboard that are inflatable, paper, or will easily squish into the compartment above my bed. 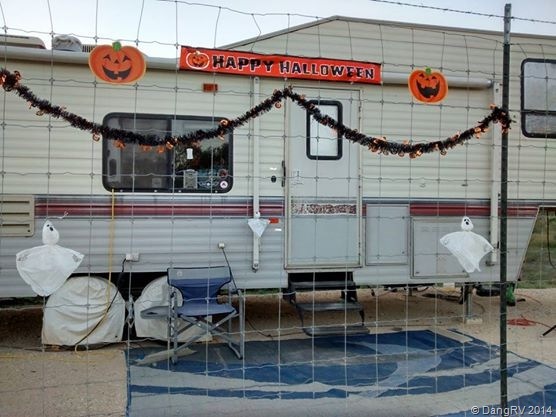 For Halloween I had a wonderful fence right in front of my RV that I could decorate all I like. I hung ghosts, a black garland, paper pumpkins, and a nice banner to get everyone in the mood for a couple weeks before the holiday. I got lots of smiles, honks, and thumbs up from the guys. A few of the guys had the good sense to say the magic words (Trick-or-Treat) early to start hitting the treats before Halloween. Men get awful hungry working hard all day on an oil rig or pipeline. A nice treat on the way back out of the gate helps to make the drive home bearable. When Halloween finally came, the guys made out like bandits. There are two sets of gate guards here and we both gave out candy and oranges. 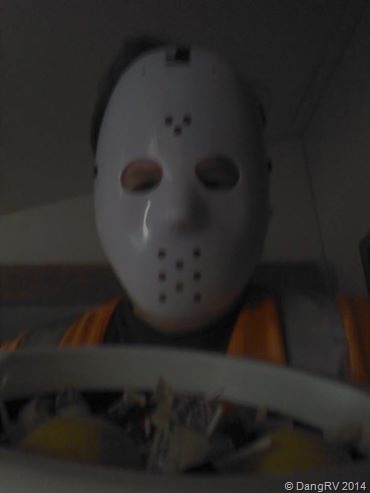 For my part, I greeted them coming in with a scary mask on and a huge bowl of goodies. One guy stopped to show me his bloody knife costume he wore for a party with his kids. Another guy came in and out wearing a scary mask. On the way out, I had fun scaring them standing in my doorway with a big knife and my scary mask. Don’t worry. I was 10 feet away behind a fence and they had already gotten candy from me. They all pointed and laughed. The decorations came down right after Halloween. A few days later, one of the guys stopped by to tell me they missed the decorations and wanted to know if I would be decorating for Christmas. Of course I will be! Wait till they see my Merry Chrismoose hat that went over so well last year that they demanded I wear it at all times. LOL!